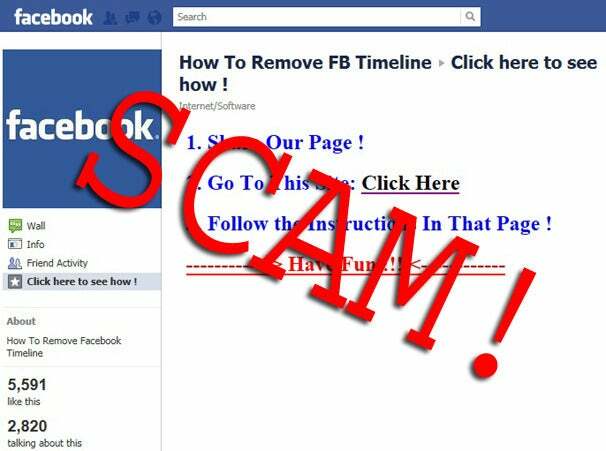 As Facebook's Timeline feature rolls out to all users, some people are falling prey to scams that claim to be able to remove Timeline from profiles. Facebook does not offer any way to get rid of Timeline once a user has switched over. Therefore, as USA Today points out, any Website or Facebook page that claims otherwise is a scam. A search for public Facebook posts with the words "remove timeline" shows thousands of users have gotten duped. Facebook pages with supposed instructions for restoring old profiles have been "Liked" thousands of times. The most popular of these pages features an app that seeks the ability to post on the user's behalf. In my tests, all this app did was advertise itself by posting status updates on my wall. Although most of these rogue pages and apps do nothing at the moment except spread virally among Facebook friends, one does link to a Website that asks for an e-mail address and tries to rope the user into promotional offers. Another asks users to fill out a survey in order to download a bogus Timeline removal script. Facebook scams are nothing new. Past attacks have included a fake "Dislike" button, a bogus video chat app, hard-to-resist links and offers for free stuff, just to name a handful. In general, the best way to stay safe is to never enter your e-mail or Facebook login information outside of Facebook.com, avoid approving third-party apps unless you know who made them and what they do, and be skeptical of any page that hides behind the "Like" button. 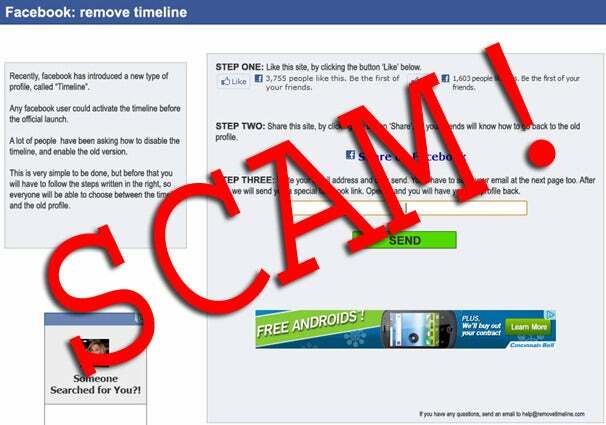 For more tips, check out PCWorld's quick guide for spotting and avoiding Facebook scams. And as long as you're stuck with Timeline, you might as well take precautions and get your privacy settings in order.